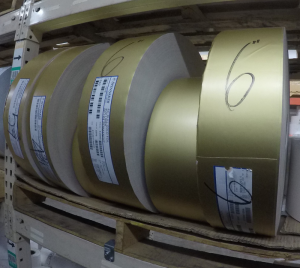 To give you a better understanding of the scope of our label manufacturing abilities, and to help you generate ideas of what you can do with labels, we have provided a list and descriptions of some of the many different materials we use. Feel free to Contact Us at anytime, or use our online Request a Quote form, to let us know just what your applications are and we will be happy to give you our suggestions on materials and our prices for creating labels that will satisfy your requirements. Hi-Gloss, Thermal Transfer, Direct Thermal, Fluorescents, Tag, and others. Polyethylenes, Kimdura, Vinyl, and others. Inks- We pride ourselves on using environmentally safe inks. We can produce any colors in the Pantone Matching System and can run standard water-based inks as well as fade-resistant, automotive pigments, metalics and fluorescents. Varnish- We use standard water-based varnishes, or various UV varnishes, such as matte finish, high-gloss finish, thermal transfer printable, direct thermal rintable, solventresistant, and hi-slip varnishes. Laminates- We can over-laminate almost any product with various materials, from polypropylenes to heavy printable clear polyesters. Adhesives- Most Arizona Custom Labels can be produced with a large variety of adhesives to suit any application, such as long-lasting outdoor permanents, removables, food grade, cosmetics, food and beverage, electronics, automotive, and many others.